The leaks keep on coming ahead of the official Samsung Galaxy Note 9 launch on August 9, and the latest one to cross our desk is an authentic-looking render of the phone in lilac purple. As we heard previously, that's one of five colors that you'll be able to pick up the handset in next month. Dutch site Nieuwe Mobiel has the scoop, and a look at how the Note 9 design differs from the Galaxy Note 8 (spoiler: not much). It would appear that the side bezels are going to be slightly thinner, and of course there will be brand new wallpaper, and that's about it. 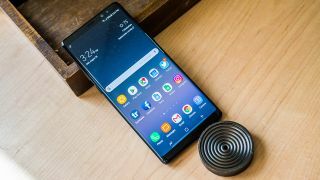 Around the back of the device, the dual-lens camera system and fingerprint sensor have been slightly repositioned – we'll probably have to wait for the Samsung Galaxy S10 for a sensor that lives under glass on the front of the phone. As for the color itself, we think it works rather well. From everything we've heard about the Note 9 from the rumor mill so far, it would appear that the S Pen stylus is going to be the star of the show: there's speculation that it's getting a speaker, a microphone, and Bluetooth support, making it altogether more useful. Oh, and apparently it's going to come in yellow. We've also seen a few pictures of the upcoming phone, which seem to confirm that the device keeps the 3.5mm headphone jack and a design that is very close to the one we saw last year. The screen size is tipped to stay the same at 6.3 inches. We'll know for sure when the Samsung event gets underway on August 9, and of course all the news you need will be right here. There has been talk that this is going to be the last of the Note devices, with Samsung reportedly deciding to focus on the two Galaxy S phones from 2019 onwards.